NEW YORK -- Secretary of State John Kerry yesterday called climate change a "grave threat" that deserves as much attention as terrorism and the Ebola virus, as hundreds of thousands of climate protesters jammed the streets demanding that governments take action. 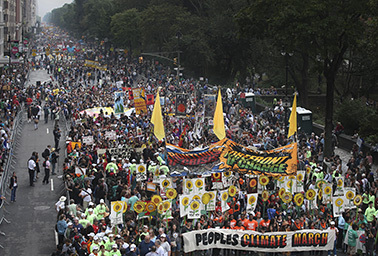 In what organizers called the largest climate change protest in history, more than 310,000 people -- triple initial expectations -- trumpeted, shouted and displayed huge banners as they paraded in midtown Manhattan. Thousands more marched in cities across the world, including London, Melbourne and even Aleppo, Syria. Celebrities Leonardo DiCaprio and Mark Ruffalo along with U.N. Secretary-General Ban Ki-moon and former U.S. Vice President Al Gore joined the masses. Indigenous women donned feathered headdresses. Teenagers juggled. One man waved a sign saying, "Melt chocolate, not polar ice." Another: "May the forest be with you." Participants said they want the day's energy to translate into local and global policies and to keep up the pressure as countries hammer out a new international agreement to be signed in Paris in 2015. 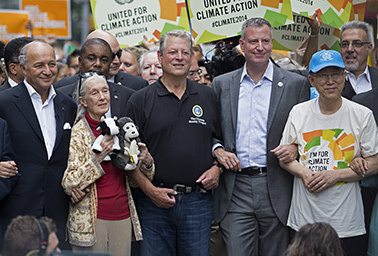 Comrades in arms: From left to right, French Foreign Minister Laurent Fabius, primatologist Jane Goodall, former U.S. Vice President Al Gore, New York Mayor Bill de Blasio and U.N. Secretary-General Ban Ki-moon march arm in arm in yesterday's parade in New York to call for action to fight climate change. Photo by Craig Ruttle, courtesy of AP Images. "The only thing standing in the way is them; the leaders are standing in the way," Ruffalo told ClimateWire before the march, jabbing a reporter's notebook as he spoke. "The technology is 100 percent available. Your leaders are the impediment, and the grip that a very small group of people have on your hearts and your moral courage." The march comes just two days before more than 120 world leaders, including President Obama, convene at the United Nations for a daylong summit on climate change before the opening of the U.N. General Assembly. While the summit is not a formal negotiating session, diplomats holed up for hours yesterday discussing some of the thorniest issues that lay before them in those talks. Kerry used a first-of-its-kind meeting of ministers from the world's biggest-emitting countries to issue a global call for attention to climate change and declare that the United States is plowing ahead with emissions cuts. "While we are confronting ISIL, while we are confronting terrorism, while we are confronting Ebola and other things, those are immediate," he said. Climate change, Kerry argued, has "greater longer-term consequences that can cost hundreds of billions, trillions of dollars and the security of the world." "There's a long list of important issues for us at the General Assembly," he said. "But the grave threat that climate change poses warrants a place on that list." French Foreign Minister Laurent Fabius, who joined the morning march, said it shows that "people are much more aware of how important this topic is." Throughout the morning, crowds of cheerful people hopped and chanted down Central Park West, some for a carbon tax and some to save the penguins. Parents pushed babies in strollers, and labor union workers took selfies with a giant papier-mache Mother Earth statue. One bearded man, strumming a banjo, led a crowd in a rendition of "Take Me Home, Country Roads." Just before 1 p.m., the crowd was asked for two minutes of silence, followed by an eruption of shouts and noisemakers meant to be an "alarm" for the world. Ben Johnson, 76, of Newark, N.J., came with his family and said he's seeing climate change along with growing air pollution hit his community at a personal level. "You have never seen asthma, influenza as bad as they are now. I think it's the air that they're breathing. It's so bad," he said. Johnson's 23-year-old son, Lawrence, said he can't remember the last time he saw substantial snow on the ground during Christmas, something he attributed to global warming. "It's no more white Christmas," Lawrence Johnson said. "Kids don't know what it is to build a snowman." And Juliet Terzian of Brooklyn, who brought her 9-year-old daughter, Edana, said she hoped to show that getting involved can make a difference. "I feel like we just need to make some changes. We all drive, and we're all hypocrites, but the government has to help make changes," Terzian said. Like many an environmental march, the protest drew a number of non sequiturs, as well. Some signs called for ending racism, others for recognizing the Armenian genocide and taxing hemp. "What's the point?" said Betsy Waters, a New Yorker who came out to watch the march. Waters said she was in favor of reducing emissions, but said, "I don't know what jobs and justice has to do with it. This just reminds me of a Halloween parade." But activists said they were proud of bringing together people from all walks of life and dozens of countries. Kathryn Leuch, 29, came from the Philippines to march. She said ever-devastating storms are becoming a "yearly narrative" of her country. She called for wealthy nations to do more to help vulnerable ones adapt -- and demanded that her own government move away from coal and stop aligning itself with Saudi Arabia in the U.N. climate negotiations. Calling for worldwide action to slow climate change, more than 300,000 people marched in Midtown Manhattan yesterday, a prelude to a U.N. summit on the issue this week. Photo by John Minchillo, courtesy of AP Images. "How can we demand that other people help us adapt to climate change when the policy of the government itself is urging more coal-fired power plants?" Leuch said. Vaishali Patil, an activist from India, said she was deeply disappointed in Prime Minister Narendra Modi for not attending. "I feel he should have participated. At least he would have given a message to the world that India cares about climate change," she said. Emma Ruby-Sachs, campaign director for the nonprofit group Avaaz, one of the march organizers, said one of the most surprising and gratifying gatherings was in Syria, where a volunteer in Aleppo organized a small climate protest. "Even with no infrastructure, in the middle of a war zone. That shows how this is not a green issue anymore; it's an everyone issue," she said. The massive outpouring in New York and elsewhere, she argued, takes away politicians' last excuse for inaction. "After [the U.N. climate talks in] Copenhagen, we spoke to world leaders and people whom we knew wanted to act. They said to us, 'We need to know that people care deeply, and that this is an issue they will vote on.' Today, we have given them that," she said.